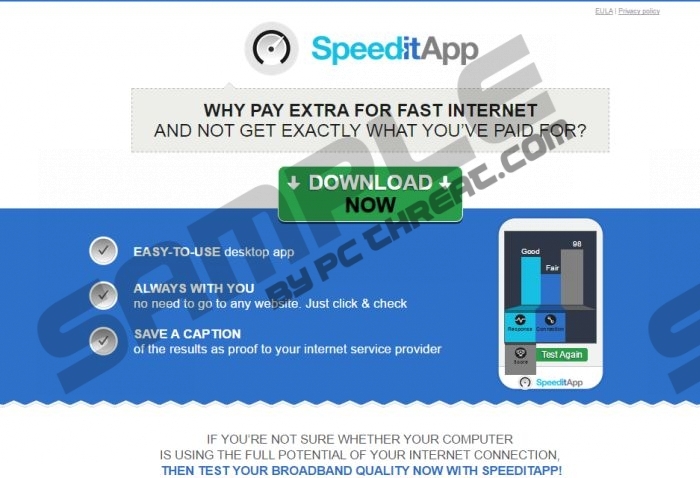 If you expect SpeedItApp to help you figure out your Internet speeds, you will be disappointed by this program. Even though the speed checker this application runs is not completely useless, trusting the data it presents is not recommended. Of course, this is not the main reason why we recommend removing SpeedItApp. What has been discovered after testing the application is that it can present advertisements, and they are not of the type you can trust. In fact, these advertisements are completely unreliable, and so you have to delete them as soon as you possibly can. Have you downloaded SpeedItApp from speeditapp.co? You probably have not, because the download button on the site is inactive, and it has been in this state for some time now. Unfortunately, the removal of SpeedItApp may become an issue you need to handle even if you have not chosen to install the program yourself. Just like Speedcheckme, SpeedChecker, TestSpeeder, and other unreliable programs that require removal, SpeedItApp travels in the software packages controlled by third-party software distributors. Can you trust these distributors? You should not, because they may package the PUP, or potentially unwanted program, with the malicious programs that you will also need to delete. Why make matters worse? Just ignore the ads and delete SpeedItApp. SpeedItApp will use tracking cookies to analyze your browsing behavior. This information is very important, because it can be used to present more attractive surveys, deals, and other types of offers. Keep in mind that the creators of SpeedItApp need you to click on the ads to earn money. Of course, you do not need to remove SpeedItApp just because it uses tracking cookies, considering that most programs employ them to collect certain information. However, you need to delete the application in order to evade the potentially unreliable advertisements. Why are they unreliable and why do you need to delete them? It all comes down to the fact that they are presented by unpredictable parties. What other programs have been installed with SpeedItApp? Can you delete them from your operating system manually? You need to evaluate your skills, because any mistake made could cause more problems. Keep in mind that it is not enough to uninstall SpeedItApp to remove it, as some files may avoid the removal initiated with this process. What can you do if you have no skills and you do not know how to remove malware? Anyone can install a security tool, and if you choose a reliable one, you will not need to do anything to remove SpeedItApp or other computer infections. Click Uninstall to delete it. Click the Windows button on the Task Bar. Click the Start button on the Task Bar. Remove the undesirable program SpeedItApp. Quick & tested solution for SpeedItApp removal.